We are pleased to send you our quarterly eNewsletter with some information about the latest developments in the debate over Article 9 in Japan, as well as some of the Global Article 9 Campaign recent activities. COMFORT WOMEN DEAL - A GENUINE STEP TOWARDS RECONCILIATION? Since the adoption of the controversial new national security legislation that significantly reinterpreted Japan’s constitution and drew unprecedented public opposition, Prime Minister Abe Shinzo and his administration have pledged to put the issue of national security on the backburner of the political agenda and prioritize economic issues instead – at least until the House of Councillors election that will take place next summer. However, Abe Shinzo has already made public his intention to resume Diet deliberations towards amending the Constitution in 2016. Given the massive public opposition to changing war-renouncing Article 9 and the reluctance by a majority in the Liberal Democratic Party (LDP) to rush the debate, the declared priority for now is the creation of new provisions, notably one regarding major disasters and other national emergencies – a subject that is unlikely to draw much resistance. The current constitution does not have any provision dealing with emergencies, such as the March 2011 Great East Japan Earthquake and tsunami, or the Fukushima nuclear disaster. Yet, nobody is duped: amending the constitution on any less-controversial issues would open a Pandora's Box and eventually lead to Abe’s long-cherished goal of rewriting Article 9. As one of Abe’s close aides put it: “First of all, [Abe will] work to promote constitutional amendment involving a state-of-emergency article after [next year’s] upper house election. That will be followed by the pursuit of his fundamental target.” “We want to revise Article 9 first, but it is an issue that would deeply divide the nation. … We have no choice but to delay a revision to Article 9 to the second amendment or later,” said another LDP senior member. In order to revise the Constitution, proposals to change each provision must be introduced separately and supported by a two-thirds majority in both chambers of the Diet, as well as by majority of voters in a national referendum. Although the ruling coalition controls more than two-thirds of the seats in the Lower House, it does not currently in the Upper House. Thus, the upcoming Upper House elections, to take place in July 2016, have major political stake. So far, opposition parties, including the Democratic Party of Japan (DPJ), the Japan Innovation Party (JIP) and the Japanese Communist Party (JCP), have not been able to capitalize on the broad public objection to Abe’s national security policy and translate it into votes. In this context, SEALDs, one of the most prominent groups that organized mass protests nationwide last year, is now calling to support candidates proposing to scrap the new laws, as well as pressing opposition parties to form a united front against the LDP-led ruling coalition. In December, the group set up a thinktank called ReDEMOS that will inform people, advise political parties and propose policies related to Abe administration’s national security policy and other sensitive questions on the political agenda. Another network, called Civil Alliance for Peace and Constitutionalism, was formed to pursue the same goal: foster collaboration among opposition parties and encourage them to nominate joint candidates at the upcoming elections to maximize the chances to vote the LDP-led government out. “The people have not forgotten their outrage over the steamrolling of the security laws and other government misconduct,” said one Alliance member. "And we will keep working to push voters to make a change,” said another. The Alliance will work with candidates who oppose the security legislation and provide them support in their election campaigns. Diverse groups that oppose the security bills continue to regularly hold protests and rallies around the Diet and support legal avenues to challenge the constitutionality of the legislation. Nearly 300 legal experts have announced the filing of at least eight lawsuits across the country next spring when the security bills come into effect. They will argue that any collective self-defense operations violate their constitutional right to live in peace. On November 3, a number of groups also launched a drive to collect 20 million signatures by May 3, 2016 to protest against the security legislation and demand that it be abolished. In parallel to seeking constitutional amendment, the government is steadily building up its military capability. On December 24, the cabinet approved a defense budget of 5.05 trillion yen ($41.4 billion) for 2016 - the biggest in 14 years. It represents a hike of 1.5% (or about 74 billion yen) compared to the previous fiscal year and the fourth annual increase in a row, after a decade of cuts in military spending. The new budget is designed to beef up Japan’s maritime security amidst territorial disputes in the East China Sea, as well as to strengthen the country’s military cooperation with the United States. The government is also taking steps to open Japan’s industry to the international market. In April 2014, the Abe administration relaxed Japan’s prohibition on arms exports and re-named it as the Three Principles on Transfer of Defense Equipment and Technology. Under the new rules, arms exports are allowed, as long as they “contribute to strengthening security and defense cooperation with Japan’s ally, the United States as well as other countries” and contribute to “international peace and international cooperation”. In order to implement the new policy – and promote arms export – a new “Acquisition, Technology, and Logistics Agency” (ATLA) was created in October 2015, under the Ministry of Defense, with a budget of 2 trillion yen ($16.3 billion) or about a third of the Defense Ministry’s budget. The hosting of Japan’s first-ever military arms fair in May 2015 consecrated Japanese ambition to establish its new status as a weapons exporter. Some of Japan’s biggest industrial conglomerates, such as Mitsubishi Heavy Industries, Kawasaki and Komatsu, are now entering the defense industry and developing military hardware for export. Their military-related production had so far been limited mainly to providing equipment to Japanese Self-Defense Forces, as well as selling military components to the United States. Developing Japan’s defense exports is not only a matter of commercial policy, but also an important dimension of Abe’s diplomatic strategy. Indeed, target customers are mainly countries in the region that share wariness about China’s growing assertiveness, such as Australia, India, Indonesia, Malaysia and the Philippines. “By providing arms to these countries we can make money, we can balance China, and strengthen and institutionalize our partnerships and empower these countries. It’s a win-win-win situation,” Michishita Narushige, Director of the Security and International Studies Program at Japan’s National Graduate Institute for Policy Studies analyses. Indeed, since the deterioration of its relation with China in 2012, Japan has increasingly been turning its attention to Southeast Asia, where Tokyo sees an opportunity to keep its rival in check and establish its expanded role in regional security under Abe’s pet doctrine of proactive pacifism. Over recent years, Japan has been gradually increasing its investment in South and Southeast Asia and developing special strategic relationships with a number of countries in the region, in particular in the area of maritime security capacity-building assistance. To that end, in February, the Abe administration revised the country’s Official Development Assistance Charter, renamed Development Cooperation Charter, in order to allow funding foreign militaries – albeit for non-combat activities. The new ODA charter reflects the administration’s approach that seeks to use development aid as a component of Japan’s national security policy. "Addressing development issues contributes to the enhancement of the global security environment, and it is necessary for Japan to strengthen its efforts as part of its 'proactive contribution to peace' based on the principle of international cooperation. Japan will utilize its ODA in a strategic and effective manner," the charter reads. Providing aid to armed forces of countries in the region that have their own share of territorial claims with China is thus part of Abe’s strategy to counter China’s influence in Asia. As a direct result of the policy shift, the administration has set aside an ODA budget of 552 billion yen ($4.6 billion), as part of the 2016 annual budget. This represents the first increase in 17 years. At the bilateral level as well, Japan has been accelerating the development of “special strategic relationships” with a number of Asia-Pacific nations. In the course of the last two months, Prime Minister Abe Shinzo has conducted high-level meetings and consultations with the Philippines, India, Australia and Indonesia to solidify their security cooperation. Indeed in November 2015, Abe met with Philippine President Benigno Aquino, on the margins of the Asia-Pacific Economic Cooperation Summit held in Manila, and they agreed in principle to pursue a strategic partnership between the two countries and start negotiating the transfer of defense equipment and technology. In December, during his visit to India, Abe signed two important security agreements in the areas of defense equipment and technology and security of military information with Indian Prime Minister Narendra Modi. Other important discussions on the agenda included the proposal for India to buy Japanese military and a nuclear deal. Just a few days later, Abe and his new Australian counterpart Malcolm Turnbull issued a joint statement highlighting their two countries’ “special strategic partnership” and cooperation in opposing any change of the “status quo” in the East or South China Sea. At the meeting, Japan’s bid for a Soryu submarine contract was also discussed. In that same week, Japan also began talks with Indonesia on transfer of defense equipment and technology that would allow Tokyo to export military equipment to Jakarta, in particular in the area of maritime security. 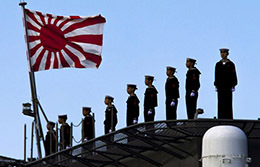 Abe’s efforts to assert Japan’s proactive security posture, in a context of rising tensions in the East and South China Sea, threaten to take place at the expense of regional peace. It is not only exacerbating regional rivalries and accelerating an arms race, but also changing the perception people in the region and the international community have of Japan as a pacific country. “LANDMARK” DEAL ON COMFORT WOMEN – A GENUINE STEP TOWARDS RECONCILIATION? 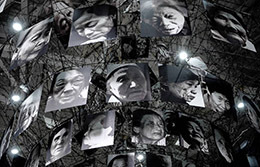 On December 28, Japan and South Korea reached what they consider to be a landmark agreement resolving their long-lasting dispute over Korean “comfort women” – a euphemism referring to the women and girls coerced into sexual slavery for Japan’s Imperial Army during World War II and the preceding Japanese colonial rule of the Korean Peninsula. Issues over wartime history, including regarding comfort women, have kept the two countries’ relations in a stalemate. Prime Minister Abe Shinzo’s revisionist attitude towards Japan’s wartime actions has stirred controversy, notably his offensive remarks over comfort women, the revision of guidelines for Japan’s history textbooks, and earlier calls to review the evidence that led to the 1993 Kono statement of apologies. South Korea’s President Park Geun-hye had refused to meet Abe until he did more to atone for Japan’s wartime actions. The unexpected resolution took place in the final days of 2015, which marked the 50th anniversary of the normalization of diplomatic ties between the two countries and the 70th anniversary of the end of the war. The agreement is a political compromise between the two governments. Issued in the form of parallel statements by Japanese Foreign Minister Kishida Fumio and Korean Foreign Minister Yun Byong-sei, the deal includes a new official apology and a ¥1 billion ($8.3 million) payment directly from the Japanese national budget to a Korean foundation providing support for the former comfort women. Today, only about 50 out of the tens of thousands of the Korean comfort women are still alive. Prime Minister Abe called Park to “express anew sincere apologies and remorse from the bottom of his heart to all those who suffered immeasurable pain and incurable physical and psychological wounds as ‘comfort women.’ ” Japan had offered an official apology in 1993 and set up a private compensation fund for the victims in 1995, but South Korea never considered it as an acknowledgement of Japan’s responsibility, for it relied on private donors. Tokyo, which always insisted the issue has been settled under the 1965 bilateral treaty that normalized diplomatic relations between the two countries, considers the new fund as a humanitarian gesture. The Korean Council for Women Drafted for Sexual Slavery by Japan, the NGO that supports the surviving women group and installed the statue, has already made clear it will not to remove it and generally does not accept the agreement. Indeed, for many human rights groups and the women themselves, the deal falls short of their longstanding demands that Japan acknowledges publicly the state’s legal responsibility, recognize the systematic nature of the coercion and exploitation, and offer formal reparations to the victims. Other demands include putting measures in place to pass on wartime history to future generations, including in Japanese school curriculum, and seeking truce and reconciliation. Strikingly, the women or organizations representing them were missing from the negotiation table. In fact, they were not even consulted, and thus they had no voice in shaping the agreement. “You could have at least let us know what kind of deal you were striking with Japan” complained one of them, quoted in the New York Times. “The women …. must not be sold short in a deal that is more about political expediency than justice. Until the women get the full and unreserved apology from the Japanese government for the crimes committed against them, the fight for justice goes on”, East Asia Researcher Shoji Hiroka at Amnesty reacted. In the face of such strong criticisms, the Korean government is trying to reach out to the public to gain understanding over the agreement. “I hope you will understand the latest agreement from a much larger perspective and in terms of improving South Korea-Japan ties,” said President Park in public address. At the regional level, the deal has been met with skepticism as well. China’s official Xinhua News Agency called Japan's settlement with South Korea “significant progress” in resolving historical issues among East Asian nations, but deplore the fact that the agreement is “more of a political choice made under pressure from the United States rather than a decision from an awakened conscience.” It also criticized Japan’s “double standard”, highlighting the fact that many comfort women also came from China, the Philippines, Taiwan and other countries in Southeast Asia. “If Japan were truly sincere in its remorse and apologies regarding the issue of ‘comfort women,’ it would have apologized to and compensated its victims regardless of their nationalities,” it added. For its part, Taiwan is seeking to obtain a similar agreement with Japan. “The Republic of China government has always said that Japan should apologize to Taiwanese comfort women and offer compensation to them,” President Ma Ying-jeou said. However, Japan was quick to rebuff the idea, making clear it does not intend to launch new talks over the issue of “comfort women” with other countries. Hailed by both the governments of Japan and South Korea as historic, the agreement was strongly welcomed by the US, which had long pushed for the resolution of the issue between its two allies. Indeed, it now remains to be seen whether the deal will hold. Talks to discuss the process of implementing the agreement are planned as early as this month. It will be a matter of overcoming the different interpretations Japan and South Korea have on the conditions to carry out the agreement, notably over the removal of the statue and the commitment to “refrain from accusing or criticizing each other regarding this issue in the international community.” The upcoming publication of a Comfort Women White Paper by Korea, the continuation of a civil society campaign to document the issue of comfort women as part of UNESCO’s Memory of the World Register, and Abe’s ability to rein in the most conservative members of his administration known for their gaffes and offensive statements, will further put the agreement to test. As substantially inadequate and procedurally opaque as the agreement is, it has been publicly presented as a “reconciliation deal”. The recent move thus should be welcomed as such: a step in the right direction. But will it be enough, if it does last, to contribute building much needed trust, peace and reconciliation between the two countries and in the region? Today, true reconciliation is fundamentally and urgently needed for a sustainable peace in Northeast Asia. 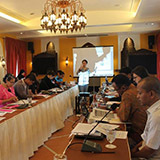 Meeting in Thailand in October 2015, the Global Partnership for the Prevention of Armed Conflict (GPPAC) Southeast Asia discussed the changing global and regional security situation, ongoing crises, and the role of peoples and civil society in peacebuilding. Concerns were raised regarding the increasing militarization of the entire Asia-Pacific region, exacerbated by territorial disputes, increasing military expenditure, and provocations and rising nationalisms. Article 9 of the Japanese Constitution was discussed as an example of an important conflict prevention and peacebuilding mechanism. Indeed, in its Global Action Agenda presented to the United Nations in 2005, GPPAC recognized this clause as "a foundation for collective security throughout the Asia Pacific region." 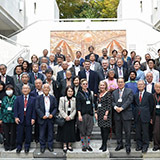 On November 21-23, 2015, the World Nuclear Victims Forum was held in Hiroshima, Japan. Participants from around the world gathered to understand the reality of the damages caused in all stages of the nuclear chain, the situations of Hiroshima, Nagasaki and Fukushima, and the lessons to be learned from such situations. It was also an opportunity for people from affected communities in various countries to strengthen their cooperation and network, to work together to prevent such suffering from happening again. In a declaration mapping out draft elements for a charter of world nuclear victims’ rights, participants acknowledged that the “complete prevention of nuclear chain related disasters is impossible” and “identified that the military-industrial-government-academic complex and states that support it … violate fundamental principles of international humanitarian, environmental and human rights law.” The document further calls for the abolition of the entire nuclear chain and the urgent conclusion of a legally binding international instrument which prohibits and provides for the elimination of nuclear weapons. 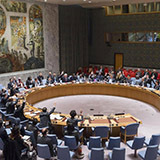 On December 9, 2015, the United Nations Security Council unanimously adopted the first-ever resolution on youth, peace and security, acknowledging the critical role young women and men play in the prevention and resolution of conflict, as well as in peacebuilding efforts. Echoing the language of Resolution 1325 on Women, Peace and Security, Resolution 2250 highlights youth's powerful role and potential as positive agents for change to address today's global challenges. Download Resolution 2250 (2015) here.